One of the earliest photos of Paul, July 2002. It is with tremendous heaviness of heart that I return to the blog to announce the passing of my beloved dog, Paul. Paul passed on Monday, January 27th of this year. At the time, my life was in a bit of a pressure cooker in many ways - personally, professionally, and otherwise, and it was all I could do to just hang on and deal with things one day at a time. I couldn't bear the thought of a big public announcement, either on the blog here, or on Facebook, where he has had a lot of fans over the years. I imagined an outpouring of well wishes and sympathy that seemed like it would crush or drown me, well-intentioned though I knew such an outpouring would be. At the same time I was counseled by a friend, that "sometimes grief needs privacy." So I gathered all the photos I knew I would want to use for this post when I was eventually ready, and then let it go and moved on in my own way. Paul was the original Parson Architecture Spokesdog™, and with his passing I felt like I had lost part of my own voice. 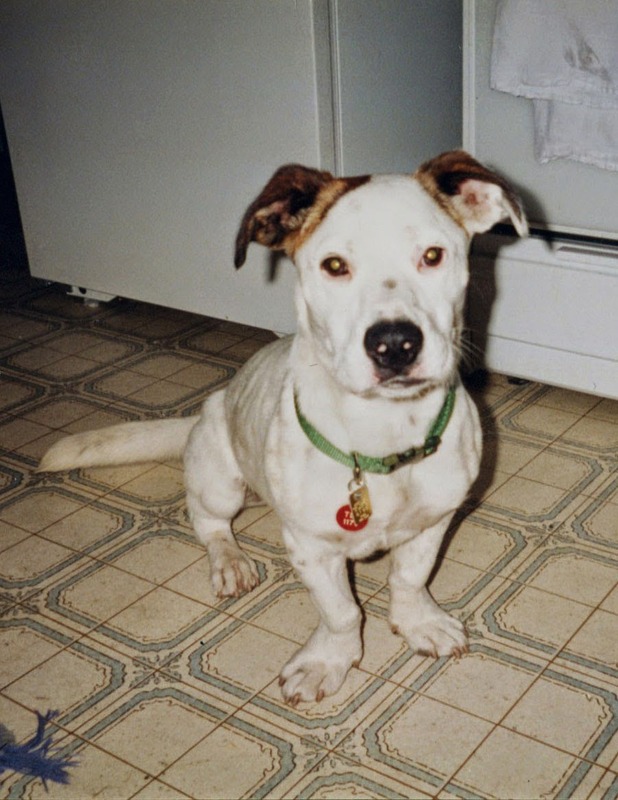 So now it is nearly 8 months later, and I finally feel like I have sufficient distance, and I'm ready to pay proper tribute to Paul Baby, who was my loyal and stalwart companion since June 26, 2002, the day I brought him home from the Beagles and Buddies Rescue. Lou Kahn was born today in 1901. I wrote a little bit about him in this post from 2011. I don't have much more to add to the volumes that have been written about his work, except to say that he's a personal favorite of mine, and definitely holds a place of honor in my Pantheon. If documentaries are your thing, you might enjoy My Architect, the documentary film about Kahn, his architecture, and his complex private life, made by his son Nathaniel. It is quite personal and touching, and is one of my favorite architectural documentaries. 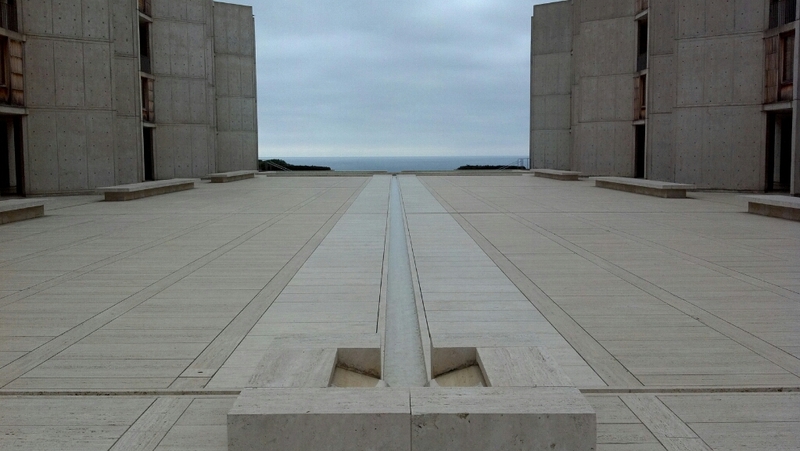 The Salk Institute was established in the 1960s by Jonas Salk, M.D., the developer of the polio vaccine. His goal was to establish an institute that would explore questions about the basic principles of life. He wanted to make it possible for biologists and others to work together in a collaborative environment that would encourage them to consider the wider implications of their discoveries for the future of humanity. Jonas Salk had a distinct vision for the Salk Institute as he worked with scientists and architects to create a new paradigm for research and collaboration. In December 1959, Salk and architect Louis Kahn began a unique partnership to design such a facility. Salk summarized his aesthetic objectives by telling the architect to "create a facility worthy of a visit by Picasso." Kahn, who was a devoted artist before he became an architect, was able to respond to this challenge. 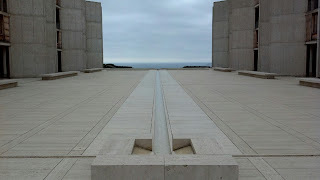 Last summer, I got to spend a little time at the Salk, during an outing from OCON. We spent a leisurely hour and a half or so, wandering around the outdoor passageways and courtyards. Although the building is most famous for its epic main courtyard and orientation to the Pacific Ocean, I find the most compelling part to be the complex layering of spaces comprising the stairwells and balconies around the researchers' private studies. Today we celebrate the birthday of design giant Raymond Loewy, one of my all-time favorite designers. I discovered Loewy when I was in high school. I was into cars, and became aware that he had done a lot of the styling for Studebaker in the '50s, so I got some books on him from the library to learn more. I had been raised with a healthy amount of respect for the maxim, "if it ain't broke don't fix it" but Loewy had the opposite approach: that there wasn't a single thing that existed that couldn't be improved. His books, Never Leave Well Enough Alone and Industrial Design, were a huge influence on me as a young man contemplating a design career. Loewy was a design powerhouse, helping to create the modern look of America in the 20th Century. He designed everything from household objects to corporate logos, cars for Studebaker (including both the iconic bullet-nose look from the early '50s and later their Avanti), locomotives, and even conceptual designs for some NASA projects. Here is a general image search under Raymond Loewy, to give you a general flavor. Here is the classic bullet-nose Studebaker. Link to the Studebaker Museum, South Bend, Indiana. Loewy's design for the Avanti, including lots of great drawings. Also, there is a lot of stuff (largely ceramics but some other really cool things as well) designed by Raymond Loewy available on Ebay here. Before writing this, I didn't realize the extent to which the Estate of Raymond Loewy was active today, but there is www.RaymondLoewy.com which claims to be "the official site of Raymond Loewy", as well as www.RaymondLoewy.org which seems to be the home of Loewy Design of Marietta, Georgia. In addition to these two, there is also http://www.loewymuseum.org, which appears to be the efforts of Loewy Design to found a museum around Loewy's work. I'm glad to see that they are actively pursuing the promotion of his legacy, and would be very excited to see them build a museum! If you are interested in 20th Century industrial design and/or automotive design, then you might also want to learn more about the following related designers: Henry Dreyfuss, Norman Bel Geddes, Walter Dorwin Teague, Virgil Exner, Brooks Stevens, Zora Arkus-Duntov, Harley Earl. Not all of these Wikipedia entries are very elaborate, but could be a good starting point for more research. There are probably a lot of really great used books out there on these designers, that could be had for cheap at www.abebooks.com. 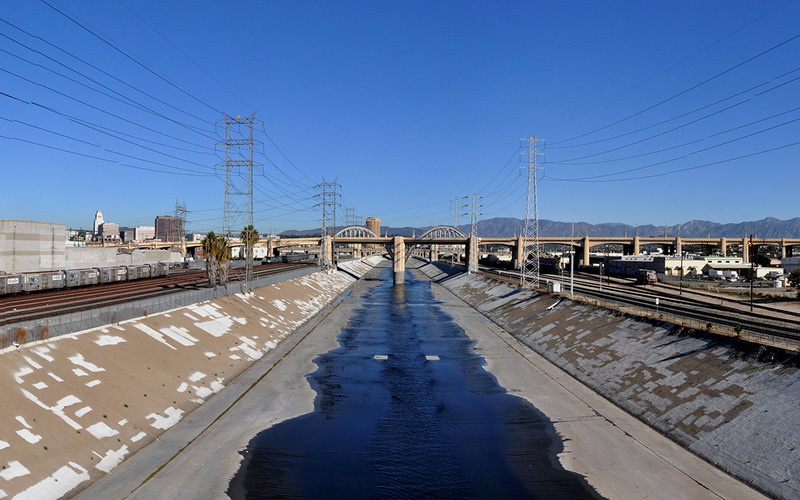 Among Los Angeles' least-celebrated treasures are her bridges. Not that they don't have their admirers, but the glorious concrete and steel spans that cross the Los Angeles River, as well as her tributary the Arroyo Seco, just don't tend to get a lot of attention. They seem to do a lot of filming down at the bridges and along the river, but nobody talks about the bridges much. 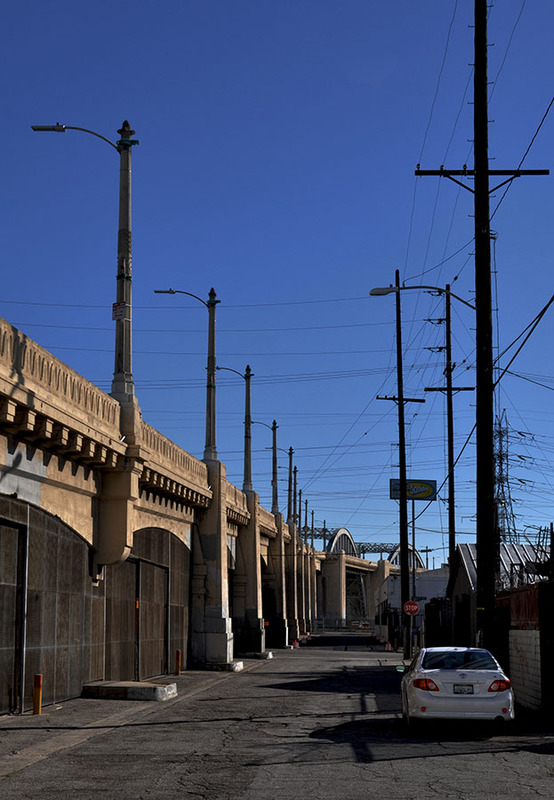 There has been an exception lately, which is the Sixth Street Bridge, only the attention it has been receiving isn't exactly the good kind. About a year ago, the L.A. City Council voted to replace the bridge, and earlier this week they announced the winning entry from among 3 teams that participated in the competition. There is a YouTube channel at this link, where you can see short videos of all 3 competition entries. The 3 teams were Parsons Brinckerhoff, AECOM, and HNTB with Michael Maltzan. HNTB/Maltzan won, and you can read more about the new bridge over at CurbedLA. Since we've been having some pretty outrageously bright and clear mornings of late, and you never know when the next 7.0 is going to come rumbling through and reduce our beloved viaduct to a pile of steel and rubble, I went out and spent some time around, under, and on the bridge. I was reminiscing, and studying, as well as just enjoying. I'm not quite ready to mourn, but I will when the time comes for that. I started off by checking out the bridge from the east side, and eventually made my way across the 7th Street Bridge, which is the next one to the south. I got out and walked back out on the 7th St. Bridge and took some pictures looking north. Click to embiggen. 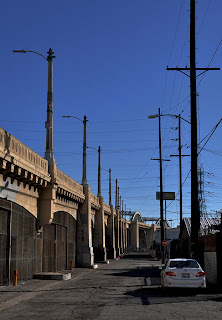 The distinguishing feature of the Sixth Street Bridge is its mirrored pair of eccentric steel arches that carry the roadway across the L.A. River. The vast majority of the bridge is concrete, and just that center portion employs steel as the primary structural element. It is this hybrid combination of materials that makes the bridge so unique. There are a lot of concrete bridges out there, and a lot of steel ones. It's not uncommon to see a steel bridge with concrete abutments or piers, but you rarely see the two materials integrated so artfully into one structure. In plan, the bridge isn't a straight line. It bends in the middle, so that the western flank is nearly straight east-west, but the eastern flank aims slightly south-easterly. This heightens the visibility of the steel arches as you approach from the west, since they are not in a straight line with your direction of travel. Between March and September of 2009, I wrote a few blog posts under the Parson Studio Group banner, before I launched Creatures of Prometheus as my main blogging platform. Since the old PSG web site is now being completely re-branded and re-designed, and the old blog will go away when my new website launches, I will be occasionally re-releasing some of those posts here over the coming months. This post originally appeared on the Parson Studio Group blog on September 23, 2009. I was recently approached by a collector who bought 2 of my pieces last November, when I participated in the Arroyo Artists' Collective fall show. Said individual indicated that he was going to a wedding and wanted a piece he could give as a gift, and wanted to know what I had in stock. As it turns out, he also prefers my furniture unfinished, that is to say without any paint or coating. He would rather let it rust naturally. So it was a pretty simple matter to weld the center seam and add legs. The biggest question I had was whether or not it would need a fifth leg at the apex, which it did. I thought it probably would, but wasn't sure. I also thought that if it were needed, the fifth leg might bother me. As it turns out, it doesn't bother me at all. I did, however, put myself through a major aesthetic inquiry to make sure I was satisfied with this style of leg for this object. I actually debated myself and agonized over it for the better part of an afternoon. I almost changed them to boomerangs at the last minute, but that will be another bench for another day. The last step was to add the chrome feet. So, I think it is the perfect wedding gift! Cheers to the newlyweds! Every New Year's Day I enjoy getting up early and watching the B2 Stealth Bomber do its annual Rose Parade flyover, to kick off the New Year. Today I looked to the skies over Northeast L.A. and the San Gabriel Valley for an even more dramatic spectacle. 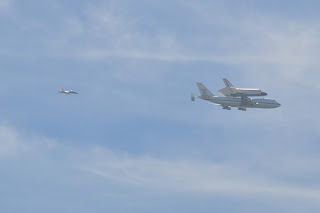 Space Shuttle Endeavour, flying piggyback on a Boeing 747, did an extended tour all around L.A.'s far-flung airspace, paying tribute to places and institutions that were instrumental in its development and missions over the years, and greeting the city that will be its new permanent home. 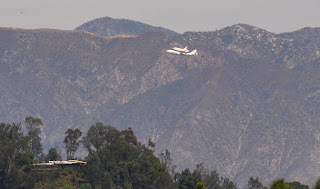 There had been considerable buzz about it all week, and many people made plans to go watch it from various vantage points around L.A. My sister Allison, who lives over on the West Side, considered going up to the Getty Center to watch for it from there, but ended up finding a parking structure rooftop right in her neighborhood with clear views of the area. 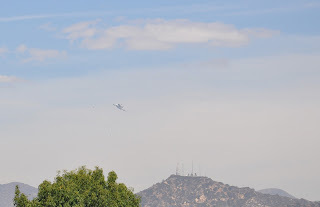 I had a meeting with a consultant here at the home office (I have a great dining room table that doubles as a conference table at the drop of a hat) and couldn't get away to go sky-watching at any of the announced flyover locations. Furthermore, I recently ordered a new plasma cutter for my shop and was expecting it to be delivered today, with signature required. Being pretty much stuck here at the house, the best I could do was head up to the roof after my meeting ended. Little did I know, I would have one of the best seats in town! As my meeting was wrapping up, Allison texted me. The timestamp was 11:53 and she wrote "On its way. Spotted over Malibu." 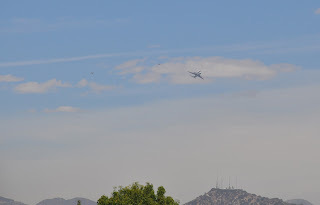 I was searching for my camera, scrambling to change my shoes to something more pitched-shingle-roof friendly, and unhooking the screen off of my bedroom window, when I heard a loud aircraft in the sky. As I scrambled up from the lower roof to the upper one (going where I had never gone before - kind of thrilling and terrifying at the same time) I saw that my neighbor was up on his roof too. He said that he had glimpsed it just then, in the western sky, but it had banked and flown back away again. 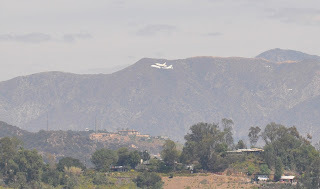 It was probably passing by Griffith Park and the Hollywood Sign at that point, but we weren't sure where it went after that. The reports were that it was supposed to do a flyover up at JPL, which is just northeast of us, so we continued to watch and wait. Several minutes passed. Then we heard it again. 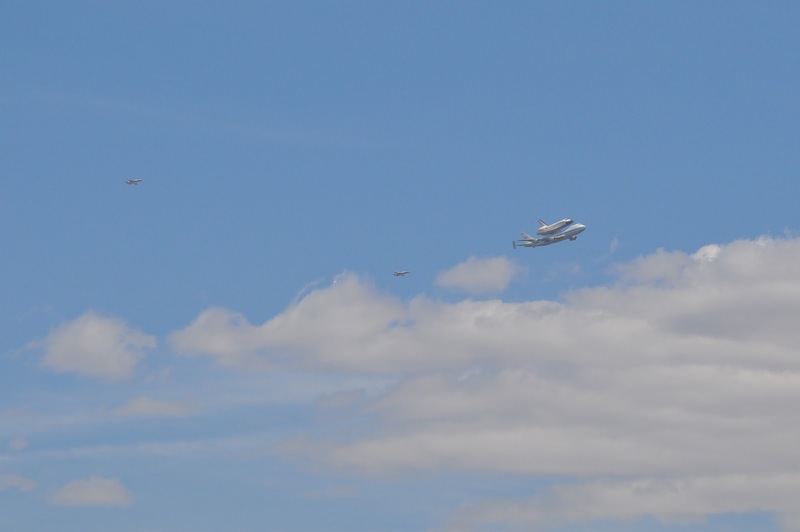 Suddenly they emerged in the western sky, coming right towards us. I took about a zillion pictures, and tried to shoot some video too, but I just wasn't any good, stability-wise, and I'm afraid the video isn't blog-quality (unless one's goal is to spread nausea among your readership, which mine is not). 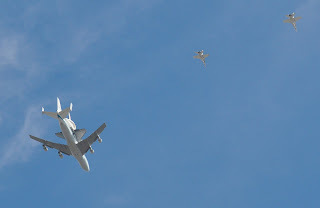 Pretty soon they were right over us. 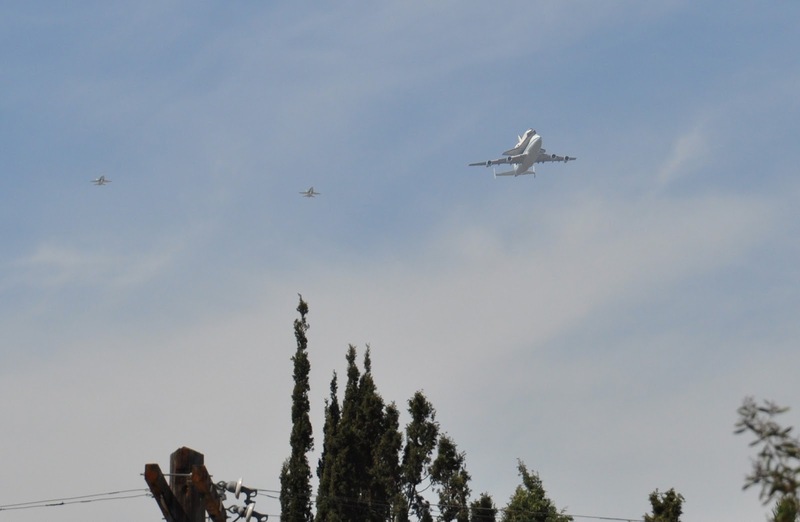 I heard on the news that one of the fighter jets was filming it and the other was the security detail. They went pretty far to the east, and I'm guessing they may have passed over CalTech before making a hard left, hooking back around and up towards JPL. Then she flew back towards the west again. 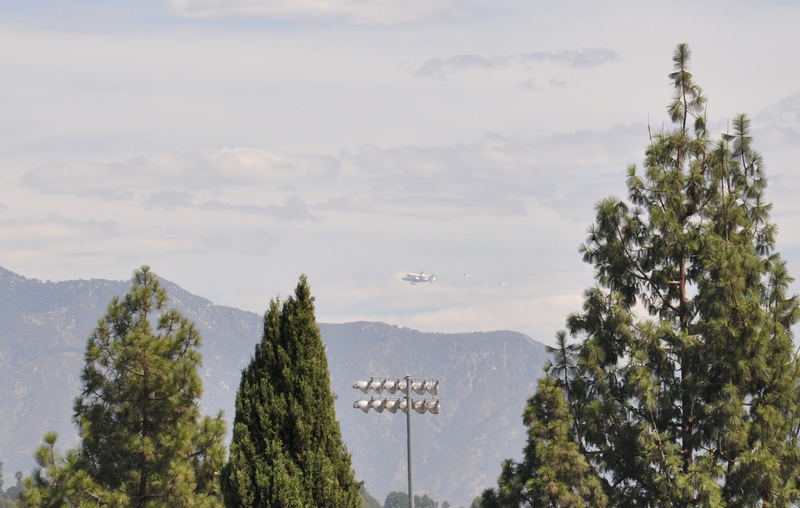 The 747 and Endeavour looked great framed against the mountain range. 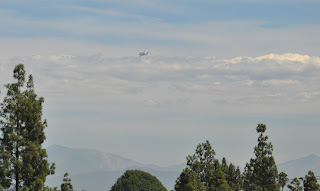 Then she lifted and banked, and came back our direction, heading towards the southeast. 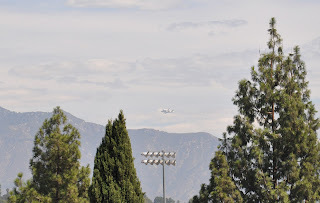 We got an awesome profile view as she departed for points south, possibly Disneyland, which I heard was on the list of flyover locations. I love that you can make out the NASA logo on the tail fin of the 747. Welcome to Los Angeles, Endeavour! 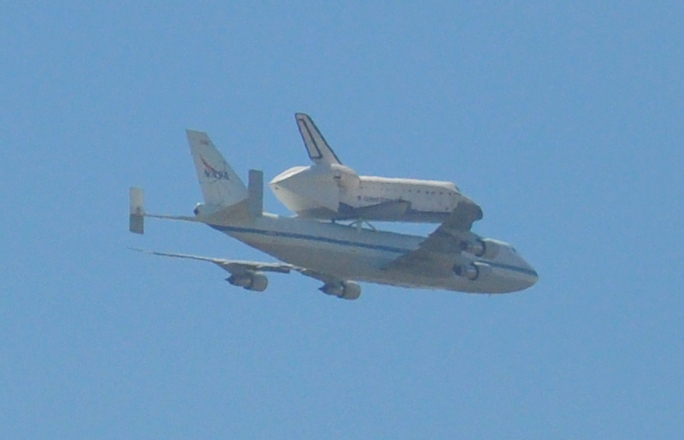 I'll be in the crowd cheering you on next month when you make your way to the California Science Center! 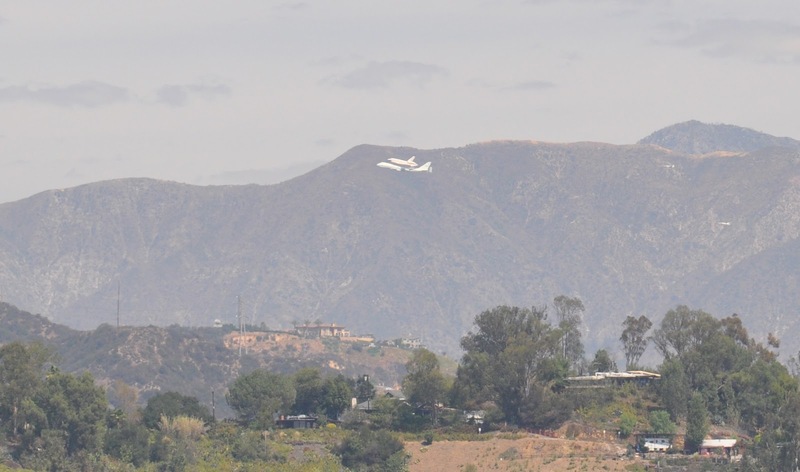 Note: Nearly a year ago, there was a big to-do for John Lautner's 100th Birthday (and deservedly so, I must say). I toured 4 of his houses in L.A. and intended to blog about them all, but only 2 posts got finished. The third post was started but never completed; now I have finished it. I didn't want to completely re-write the beginning, so I am just appending this note at the top. To see all my posts on Lautner, click here.